A quaking Pudding Take a qt. of cream & beat 3 or 4 spoonfulls wth. 2 or 3 spoonfulls of flower of rice a [peny?] grated white loaf & 4 eggs put to it orange flower water sugar & sweet spice butter ye. cloth & tye it up but not too close wn. ye. pott boyls put it in boyle it an hour yn. turn it in a dish stick it wth. slicd cittron yn. let ye sauce be sack & orange flower water wth. ye. 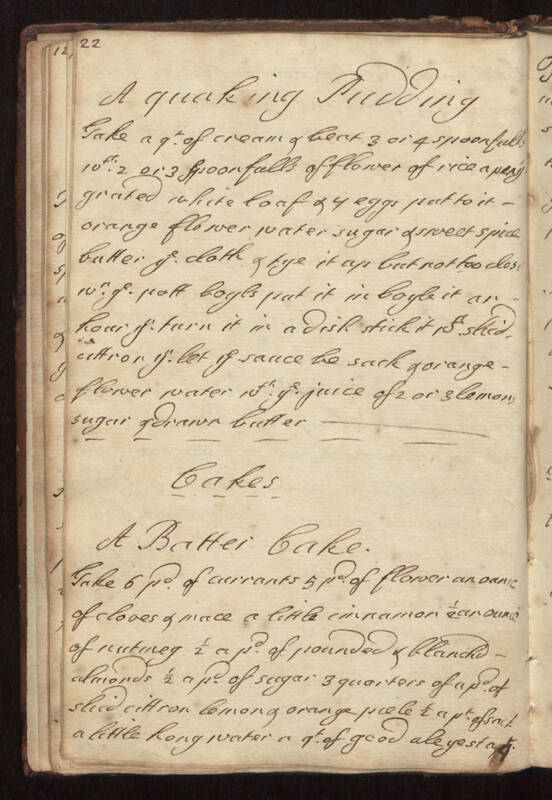 juice of 2 or 3 lemons sugar & drawn butter Cakes A Batter Cake Take 6 pd. of currants 5 pd. of flower an [ounce?] of cloves & mace a little cinnamon 1/2 an ounce of nutmeg 1/2 a pd. of pounded & blanchd almonds 1/2 a pd. of sugar 3 quarters of a pd. of slicd cittron lemon & orange piele 1/2 a pt. of sack a little [long?] water a qt. of good ale yest a qt.